This artist's rendering shows a wooly rhino using its flattened horn to sweep snow away in order to find vegetation for food. A 3.6-million-year-old woolly rhinoceros fossil discovered in Tibet indicates that some giant mammoths, sloths and saber-tooth cats may have evolved in highlands before the Ice Age, experts say. A paper to be published on September 2, 2011 in the authoritative magazine Science reveals the discovery of a primitive woolly rhino fossil in the Himalayas, which suggests some giant mammals first evolved in present-day Tibet before the beginning of the Ice Age. The extinction of Ice Age giants such as woolly mammoths and rhinos, giant sloths, and saber-tooth cats has been widely studied, but much less is known about where these giants came from, and how they acquired their adaptations for living in a cold environment. A team of geologists and paleontologists led by Xiaoming Wang from the Natural History Museum of Los Angeles County (NHM) and Qiang Li of Institute of Vertebrate Paleontology and Paleoanthropology, Chinese Academy of Sciences, uncovered a complete skull and lower jaw of a new species of woolly rhino (Coelodonta thibetana) in 2007, at the foothills of the Himalayas in southwestern Tibetan Plateau. "Cold places, such as Tibet, Arctic, and Antarctic, are where the most unexpected discoveries will be made in the future — these are the remaining frontiers that are still largely unexplored," said the NHM's Dr. Wang. There are dual connections between the new paper and the Natural History Family of Museums (including the Natural History Museum and the Page Museum at the La Brea Tar Pits). Dr. Wang contributed to NHM's Age of Mammals exhibition, which depicts the creation of the Himalayan Mountains and Tibetan Plateau, and subsequent climactic changes of the Pleistocene Ice Age. Additionally, the largest Ice Age megafauna collection in the world is excavated, researched, and displayed at the Page Museum. 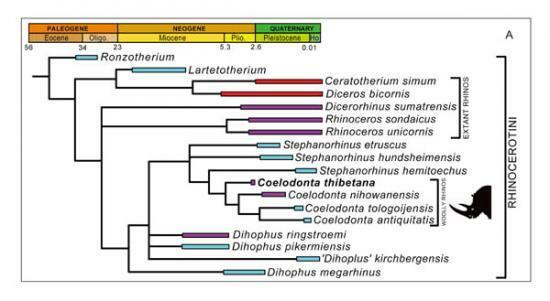 The new rhino is 3.6 million years old (middle Pliocene), much older and more primitive than its Ice Age (Pleistocene) descendants in the mammoth steppes across much of Europe and Asia. 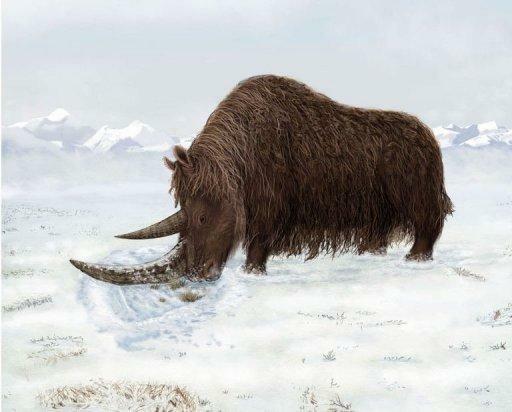 The extinct animal had developed special adaptations for sweeping snow using its flattened horn to reveal vegetation, a useful behavior for survival in the harsh Tibetan climate. These rhinos lived at a time when global climate was much warmer and the northern continents were free of the massive ice sheets seen in the Ice Age later. The rhino accustomed itself to cold conditions in high elevations and became pre-adapted for the future Ice Age climate. When the Ice Age eventually arrived around 2.6 million years ago, the new paper posits, the cold-loving rhinos simply descended from the high mountains and began to expand throughout northern Asia and Europe. In addition to the new woolly rhino, the paleontologist team also uncovered extinct species of three-toed horse (Hipparion), Tibetan bharal (Pseudois, also known as blue sheep), chiru (Pantholops, also known as Tibetan antelope), snow leopard (Uncia), badger (Meles), as well as 23 other kinds of mammals. 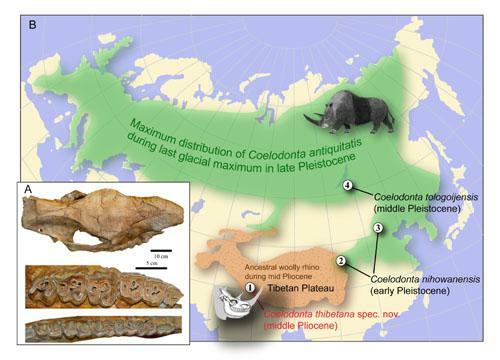 The team's new fossil assemblage from Tibet offers new insights into the origin of the cold-adapted Pleistocene megafauna, which has usually been sought either in the arctic tundra or in the cold steppes elsewhere. This new evidence offers an alternative scenario: the harsh winters of the rising Tibetan Plateau may have provided the initial step towards cold-adaptation for several subsequently successful members of the late Pleistocene mammoth fauna in Europe, Asia, and to a lesser extent, North America. The Tibetan Plateau may have been another cradle of the Ice Age giants. "This discovery clarifies the origin of the woolly rhinoceros — and perhaps much of the now extinct, cold-adapted, Pleistocene Eurasian megafauna — as the high-altitude environments of the Zanda Basin of the primordial Pliocene Himalayas," said H. Richard Lane of the National Science Foundation (NSF)'s Division of Earth Sciences.